This women's Fluer-de-Lis wedding band ring in 14K gold from Apples of Gold Jewelry features a continuous Fluer-de-Lis design around the entire band of the ring. 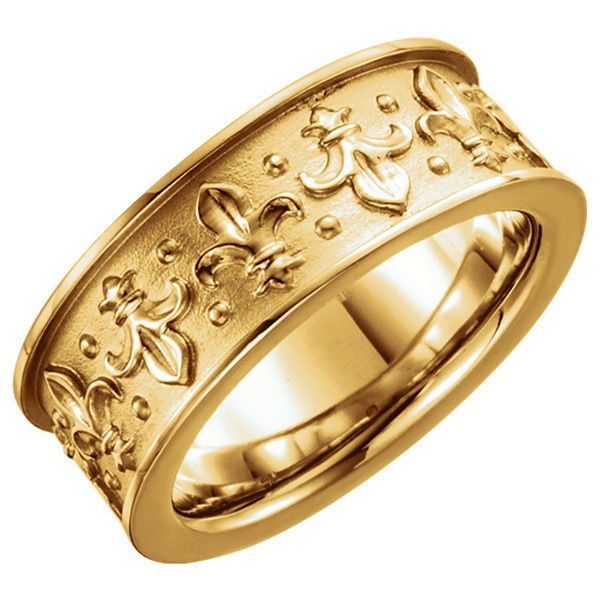 The 14K yellow gold band is 7.75mm wide, which features the Fluer-de-Lis design around the band. The Fluer-de-Lis design is associated with The Song of Solomon's "Lily Among Thorns," and offers a creative wedding band when the design is imprinted on the band of the ring. We guarantee our Women's Fluer-de-Lis Wedding Band Ring in 14K Gold to be high quality, authentic jewelry, as described above.